One week on the drying rack and my saucisson is looking pretty good! My bangers were taking a bit of a battering from the hurricane-like conditions in London on Saturday so I had to nurture them indoors for a while (which Rach didn't really enjoy....jealousy? ), but other than that signs are positive. They’re dropping weight at a decent rate (a little under 20% so far), have turned a nice deep red colour and are smelling lovely and porky. Best of all, they’ve got a tiny touch of that powdery white mould I was after, so I’m hopeful it will spread over the next week and that the final product will be nice and authentic! "Is that the International Space Station? 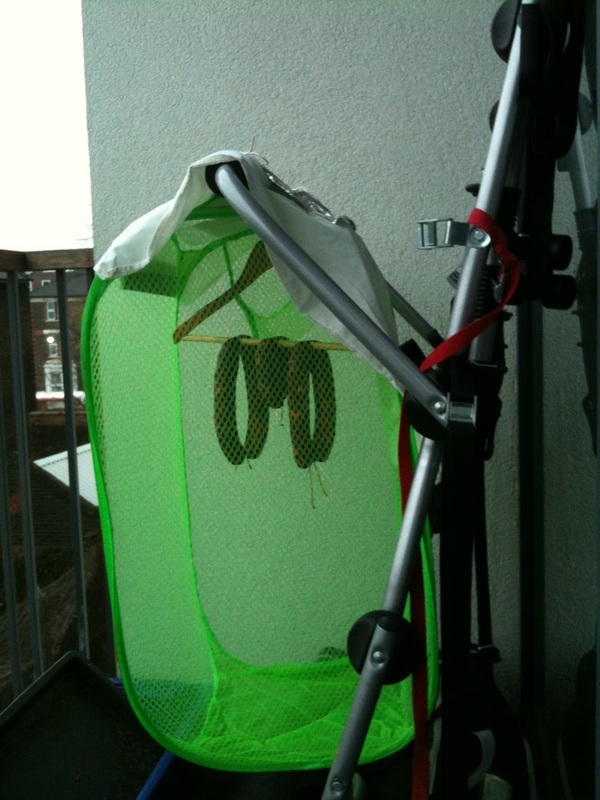 Oh, it's just a hi-tech sausage-drying vessel..."
T-minus 1 week till sausage o’clock........hopefully the saucisson will be ready by then, too (weheeey!). 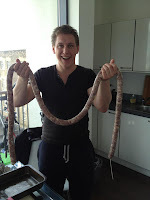 Had my first crack at a French-style saucisson sec this weekend, accompanied by my sausage right-hand man and expert handle-turner ‘Dr’ Simon Pick, as well as charcuterie newcomer and casual spectator Si ‘Boony-foony’ Boniface – a man who never shies away from a sausage. The key ingredient – as always – was a couple of kilos of finest free range pork shoulder from the brilliant Hennesey’s butchers on Northcote road, with a bit of extra back fat thrown in there to get the right balance of fat-to-lean. Flavourings-wise, we went for simplicity: plenty of garlic, white pepper and red wine (no doubt later batches will be a bit more experimental, but I wanted a pure-pork flavour to really test the process on this first batch of saucisson). The saucisson sec recipes I looked at in coming up with mine called variously for either red wine or brandy – as much there for flavouring as to lower the pH of the mix and thereby discourage nasty bugs. In the end my decision was based on the inevitability of my drinking anything that didn’t go in the sausage, so I took pity on my liver and went with the wine, which also has the added bonus of imparting a nice rouge tinge to the sausages. ﻿I have to say that sausage-making went extremely smoothly on Saturday morning. A couple of new pieces of kit (some electronic scales and a big stainless steel mixing bowl with plenty of room to spare) made things a hell of a lot easier, but the real time-saver was grinding the meat on a coarse plate as opposed to cutting it by hand. It remains to be seen whether this will adversely impact the texture of the finished product, but from the look of it the wet mixture was of a similar texture to previous hand-cut mixes, so I’m hopeful it will be just as good. My single worry with this current batch is trying to get that authentic coating of white mould that you see in shop bought saucisson sec. 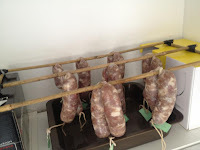 I’ve tried to promote this by ‘basting’ the sausages in a bactoferm solution prior to fermentation, and hanging a shop-bought, mould-clad saucisson in the middle of my beauties. So far, though, whilst they look and smell spot on, there is a distinct lack of powdery whiteness. I live in hope. Having setup this blog a while ago, I promptly forgot to update it. So as a prelude to my first proper blog, here’s a short run-down of events so far. In February I made my first attempt at charcuterie in the form of a Spanish style dry-cured Chorizo, aided by the game ‘Dr’ Simon Pick. It was a qualified success. A success in that it looked like chorizo, smelled like chorizo and even tasted like chorizo, and – most importantly of all – it didn’t kill us! Qualified in that it was very definitely on the ‘salty’ side. Not world beating sausage yet, then, but confidence was high: the process had worked! Now confident of not killing myself and my loved ones, March’s batch 2 got a bit experimental. Starting from the same basic recipe I reduced the salt content (actually, I didn’t – I just measured it out more accurately), and added fennel seeds and dried chilli. The results – if I say so myself – were pretty damn good! The fennel was pronounced but not overpowering, whilst the chilli was subtle and imparted a real lingering flavour. Still a touch over-salty. Going in the right direction, though. 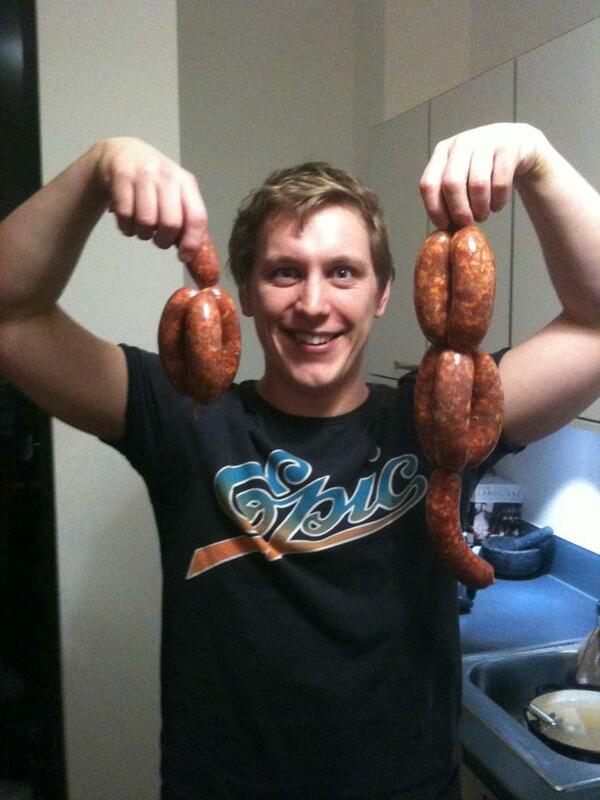 My name is Adam and I’m a porkoholic. Having been given a hand-cranked sausage machine for Christmas, I made it my 2012 resolution to master the fine art of charcuterie, or contract botulism trying. 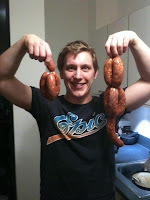 Follow my meaty and almost innuendo-free exploits here – who knows, there may be a sausage in it for you (weheeey! ).